“Law Innovations Directory and Diary 2011 is a directory of essential information about the various trial courts situated in Metro Manila, as well as higher courts such as the Supreme Court, the Court of Appeals, the Court of Tax Appeals and the Sandiganbayan. Professionally designed for maximum convenience and portability, it is bound to be among the essential tools of the trade for the practicing Philippine lawyer. It also provides a handy means for business and media professionals, and the general public at large, for corresponding with the branches of courts in Metro Manila. Available for pick-up at designated offices within the Makati, Taguig, Alabang, Ortigas, and Manila areas. Speaking as one with a keen personal interest in human evolution and Philippine prehistory, I am tremendously excited by the discovery of what apparently are the oldest human remains ever found in the Philippines – the Callao Man, which at 67,000 years, predates Tabon Man by around 17,000 years. The discovery was made back in 2007, following an archaeological excavation of the Callao Caves in Cagayan Province led by Dr. Armando Mijares of the Archaeological Studies Program at UP Diliman. Callao Man consists of a single bone (the third metatarsal of the foot), yet it has been identified as a human, and there even is speculation that it might be of a pre-modern human species which if confirmed, will rewrite the story of evolution. Nonetheless, the Callao Man discovery is archaeologically significant not only because it is the oldest human remains in the Philippines (ang Unang Pinoy! ), but also it lends credence to the theory that as far back as 67,000 years ago, humans were already capable of travelling long distances by sea, with no visible land masses in sight. Though Callao Man was discovered back in 2007, it is the first significant archaelogical discovery in the Philippines since the enactment last December of the National Cultural Heritage Act of 2009 (available for download from NCCA website, PDF format). The law was designed to conserve our nation’s cultural heritage by imposing protections on our cultural property. Interestingly, the language of the law does not contain any specific reference to human remains as among those objects which may be classified as cultural property, perhaps a sign that the legislators were queasy about the subject. In Civil Code conception, human remains are considered as property, and it is the immediate family members who control the interment or disposition of the body; while under the Organ Donation Act of 1991, it also is an immediate family member or guardian who is capacitated to donate an organ of a decedent who left no express wishes on that matter. Under Sec. 33 of the Indigenous Peoples Rights Act of 1997, indigenous cultural communities or peoples have the right to repatriation of human remains, and it is possible that this right may soon come to clash with scientific examination of ancient human remains, similar to the dispute over Spirit Cave Man in Nevada. Members of the Philippine bar would know what the Official Gazette is, but few are likely to have ever seen or held a physical copy of the publication. That may change soon, as the Official Gazette is now online at www.gov.ph. The launch of the beta version of the site was announced earlier today by Manolo Quezon (now a member of the Communications Group of the Aquino administration) on his Twitter feed. There shall be published in the Official Gazette (1) all important legislative acts and resolutions of a public nature of the Congress of the Philippines; (2)all executive and administrative orders and proclamations, except such as have no general applicability; (3) decisions or abstracts of decisions of the Supreme Court and the Court of Appeals as may be deemed by said courts of sufficient importance to be so published;(4) such documents or classes of documents as may be required so to be published by law; and (5) such documents or classes of documents as the President of the Philippines shall determine from time to time to have general applicability and legal effect, or which he may authorize so to be published: Provided, That for the purpose of this section everyorder or document which shall prescribe a penalty shall be deemed to have general applicability and legal effect: And provided, further, That the term “document” as used inthis section shall include any order, regulation, rule, certificate, license, notice, or similar instrument issued, prescribed, or promulgated by any executive department, bureau,office, commission, independent board, agency, or instrumentality of the administrative branch ofthe Government, but not the legislative or judicial branch of the Government. Among the matters provided in the Official Gazette which would be especially of public interest would be newly enacted laws and executive/administrative orders of general application. So far, the text of these laws or executive orders have been relatively hard to come by online, unlike Supreme Court decisions which are almost immediately published at the Court’s website. The public and the legal community would welcome the prospect of the Official Gazette being an online repository of the newest laws and executive issuances. For lawyers in particular, one interesting question will arise from this development. Originally, Article 2 of the Civil Code provided that “[l]aws shall take effect after fifteen days following the completion of their publication in the Official Gazette…”, a requirement which the Supreme Court reiterated and reinvigorated in Tanada v. Tuvera (1986). However, in June 1987, President Cory Aquino, using her then extant law-making powers, amended Article 2 of the Civil Code (through E.O. No. 200) by now providing publication in a newspaper of general publication as an alternative to the Official Gazette. Since then, the general assumption has been that laws take effect within 15 days from the time they are published in the newspaper, rather than in the Official Gazette which traditionally takes some time to be printed. There is now the possibility though, with the new online presence of the Official Gazette, that the 15 day period might be counted from the time the laws or issuances are posted online at http://www.gov.ph. The passage of a law amending either the Article 2 of the Civil Code or Commonwealth Act No. 638 could guarantee that date of the online publication of laws on the Official Gazette Online would count as the reckoning point for the 15-day period. However, in the absence of such an amendatory law, the doctrine pronounced in 2008 by the Supreme Court in Garcillano v. House of Representatives could preclude such a claim. In Garcillano, the Court debunked the claim that the publication in its website by the Senate of its rules of procedure for inquiries in aid of legislation satisfied the requirement under Section 21, Article VI of the Constitution that it conduct such inquiries “in accordance with its duly published rules of procedure”. The Court then even refuted the argument that the E-Commerce Act of 2000 validated such online publication. The invocation by the respondents of the provisions of R.A. No. 8792, otherwise known as the Electronic Commerce Act of 2000, to support their claim of valid publication through the internet is all the more incorrect. R.A. 8792 considers an electronic data message or an electronic document as the functional equivalent of a written document only for evidentiary purposes. In other words, the law merely recognizes the admissibility in evidence (for their being the original) of electronic data messages and/or electronic documents. It does not make the internet a medium for publishing laws, rules and regulations. Garcillano was decided on an 8-6 vote, and the closeness of the vote intensifies the possibility that this doctrine may later be reversed. But until that point, or the passage amendatory legislation, the prudential measure remains to continue publishing laws on newspapers of general circulation, and to reckon the effectivity of the law from the date of newspaper publication. Still, there is tremendous benefit to the public with the online presence of the Official Gazette. Not only does it increase public awareness over the actions of our government, it further bolsters the constitutional right to information on matters of public concern. In a strikingly novel move, the Supreme Court of the Philippines now has its own official Twitter and Facebook accounts. Atty. Midas Marquez of the Court’s Public Information Office made the announcement today in a press conference and even hinted that Chief Justice Renato Corona may “tweet once in a while”. It is not immediately clear if any of the other national Supreme Courts around the world also maintain an official Twitter account. The State Supreme Courts of Florida and Indiana do have Twitter accounts (opened just within the last few months), while a seemingly official looking account of the United States Supreme Court was later revealed as bogus. The Philippine Supreme Court could have very well been the first High Court in the world to have dived into the social media pool. Any palpable effects that may ensue will certainly be watched by other judicial organs which may be considering a similar move. We’ve prepared a one-page guide to voting (English and Filipino versions) which the Filipino voters can bring with them to the polling places as they cast their ballots on election day. Given that the experience of automated elections is novel, there likely will be some confusion at the precinct places, and rampant opportunity to exploit if not frustrate the sacred right to suffrage. This guide, which is based on Comelec Resolution No. 8786 issued last 6 March 2010, will hopefully arm and protect the voter, providing an immediate reference for them should any questions or challenges arise on election day. The guides are in PDF format, please feel free to mass produce them if you wish and give out to friends, family and neighbors. Law Innovations is a strictly non-partisan organization, and this project was developed solely at our own initiative, without the assistance of any political organization (or anybody else actually). We do however urge our voters to vote deliberately and wisely. Last April 30, the COMELEC released Resolution No. 8839, which details the Contingency Procedures to be observed should there be problems in the operation of the Automated Election System. The Resolution is available at the COMELEC website, but should there be problems accessing the same, it is available for download here. Law Innovations is selling an Philippine Automated Elections Kit consisting of the General Instructions to the Board of Election Inspectors and Board of Canvassers, Resolutions on Pre-Proclamation Controversies and Protests and Election Calendar, Q&As, Pollwatchers Guide, sample forms for Challenge to Voters and Protests, and a CD Compilation of all COMELEC Resolutions for the 2010 elections. Buyers will also be entitled to free updates on the latest election-related issuances from the COMELEC via e-mail until election day. All these for Php 1,200. For details, contact (+632)568-5445/fax (+632)8092261, or e-mail law.innovations@gmail.com. A heads up from our friend and emerging international arbitration specialist Jun Bautista. For those involved in arbitration practice, some important news out there. The International Chamber of Commerce, the largest business organization in the world and one of the leading providers of arbitration services worldwide, will be revising its arbitration costs effective 1 May 2010. This will be the first time since January of 2008 that the ICC will be revising its arbitration costs. The revised costs, as reflected in Appendix III of the ICC Rules of Arbitration, may be found here (PDF). The Commission on Elections promulgated several important Resolutions to regulate the conduct of the 2010 Automated Elections. Among them is Comelec Resolution No. 8804, dated March 22, 2010 entitled “Comelec Rules of Procedure on Disputes in an Automated Election System in connection with the May 10, 2010 Elections.” There are other resolutions which were recently passed governing the other aspects of the entire electoral process. 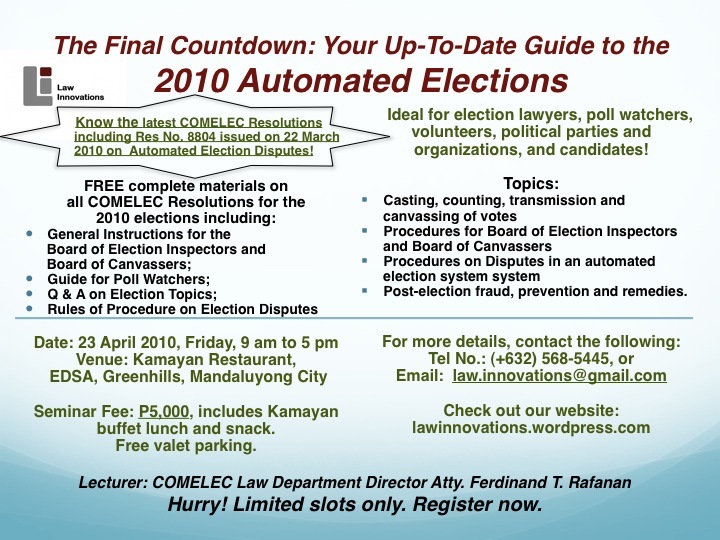 In this connection, Law Innovations will be conducting a one-day seminar on April 23, 2010 on important and latest updates on the 2010 Automated Elections. It will be held at Kamayan, EDSA, Greenhills, Mandaluyong from 9:00 a.m. to 5:00 p.m.
§Post-election fraud, prevention and remedies. Be better prepared for the 2010 automated elections. If you are an election lawyer, a member of a political party or a candidate, this may be your last and best opportunity to update your knowledge and increase your confidence for the coming first nationwide automated elections. Seminar Fee: P5,000, includes Kamayan buffet lunch and snack. Free valet parking. There are limited slots available so hurry and secure your reservation. Payment is required upon registration. (5) For group reservation, names of all the participants. 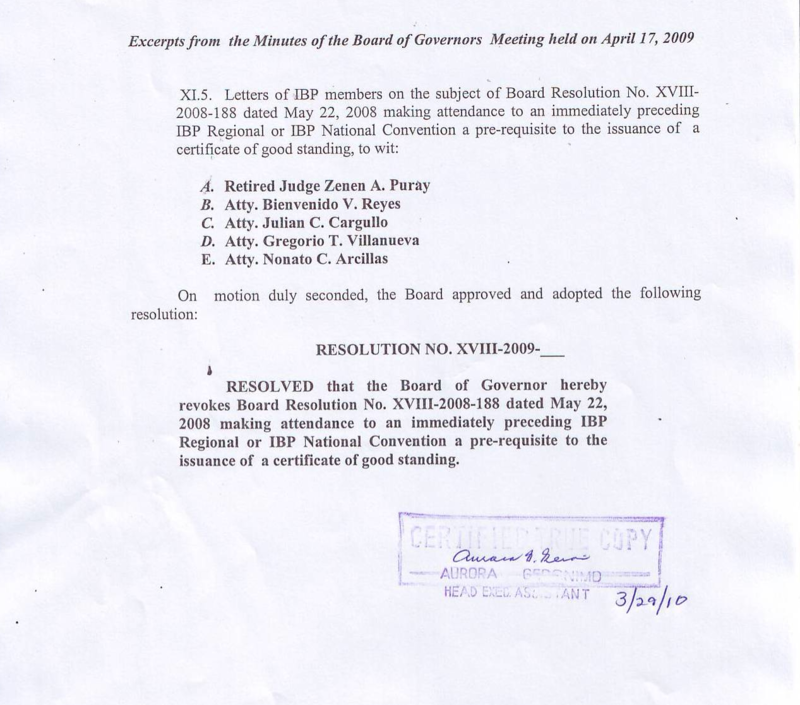 Last 2008, the Integrated Bar of the Philippines passed IBP Resolution No. XVIII-2008-188 which mandated attendance in the immediate preceding IBP Regional or National Convention in order to obtain a Certificate of Good Standing from the IBP. This new requirement has led to questions even until now whether one has to attend these conventions. However, last 17 April 2009, the IBP Board of Governors issued a new resolution revoking the 2008 Resolution. Therefore, one need not have attended the previous IBP conventions in order to be certified as a member in good standing. Law innovations is proud to announce that it will be holding a 36-hour full credit MCLE series on March 11, 12, 18 & 19, at the 2nd floor, Kamayan EDSA. Among the featured lecturers are Solicitor-General Alberto Agra, POEA Director Atty. Jennifer Jardin-Manalili, and COMELEC Law Director Ferdinand Rafanan. Participants may avail of our early bird rate of Php 8,000 if they pay on or before 3 March 2010, and the pre-payment rate of Php 9,000 if they pay before March 11. The on-site rate is Php 11,000 for the full 36-hour course. Participants who are looking for partial credits may avail of our whole-day and half-day rates. Visit our MCLE page for more details and updates.